Lifetime sit-on-top kayaks are a brand new product Lifetime just took in within the last few months. Lifetime purchased a company they had been making the kayaks for due to their wide appeal and great quality. 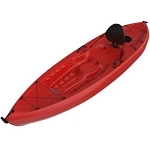 These kayaks feature a polyethylene plastic hull and a sit-on-top design. The sit-on-top design differs from other kayaks due to how the rider is positioned in relation to the kayak. So a sit-on-top kayak means that the riders legs are exposed and free; as opposed to a sit-in kayak where the riders legs are enclosed in the kayak itself. Lifetime Products kayak design also has a flat bottom feature to help beginner and intermediate kayakers to avoid tipping the kayak while in use. Lifetime has several sizes and features in their kayak line. At the low end, Lifetime has a Youth kayak, available in pink, blue, and yellow that is perfect for younger riders. Next, Lifetime has an adult size kayak, which features a longer size and higher weight capacity. Lastly, Lifetime has a tandem kayak in both a recreational Lifetime tandem kayak model and a fishing tandem kayak model. Check out this video of the Lifetime kayak in action. Sit-on-tops, or SOTs for short, are quickly getting a greater appeal. This style, like the Lifetime Lotus and Monterey, allows the paddler to sit on the top of the kayak deck. There is not an "inside" that can be inhabited by the paddler. The only access to, if any, to the inside of the kayak will certainly be with storage space hatch openings. Every little thing from the foot wells to the seat back will be rigged on to the real deck of the kayak. It is much harder to stay dry paddling a SOT. With each wave, riffle or sprinkle the paddler obtains significantly much more moisture. There is no cockpit or deck location to stop water from sprinkling up onto the paddler's body. As a result of this, SOTs are remarkably popular in warm weather and also tropical areas. Another factor these kayaks are wonderful for cozy climate is because it is very easy to move into the water for a quick dip and climb back into the kayak. Unlike a sit-inside kayak, you could reenter your SOT from the water. It will not be graceful, however you could pull yourself back up onto the deck of your SOT as well as rearrange on your own for navigating. For a slightly drier ride, you can obtain scupper plugs. Scupper plugs will cover the self-bailing drain gaps found on lifetime sit on top kayak products. The function of the scupper opening is to enable water that sprinkles on the deck to drain back out and also not pool below the paddler. Shutting out these gaps will certainly keep little splashes from turning up from underwater with the openings yet it will certainly keep any kind of water that makes its means onto the deck from draining back out.View more awesome kayak products here. Lifetime Kayaks are wonderful for kayaking and our family uses ours all the time and we have great fun. Enjoy your new lifetime kayak.